Oficer Steve Webb talks to media after horror crash. UPDATE: Fatigue was behind a collision between a car and truck that has left a teenage girl fighting for life in hospital, Sergeant Steve Webb from the Forensic Crash Unit said. 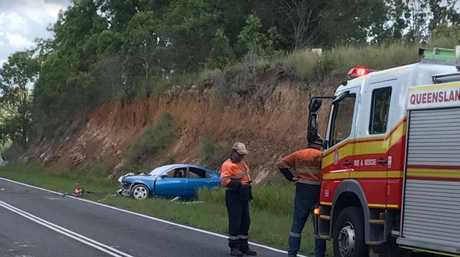 "A this stage investigations have shown that the blue car ... was on the incorrect side of the road at the time of impact.," he said. "The driver of the truck has tried his best to move to the left to avoid a collision but unfortunately at this stage we've had two patients airlifted to hospital. "One 17-year-old female was in a critical condition we've been advised." Sgt Webb the teen was travelling in the backseat of the car when the crash happened, while the driver of the car suffered severe leg injuries. "I believe fatigue definitely played a part in this crash from my investigations so far," he said. 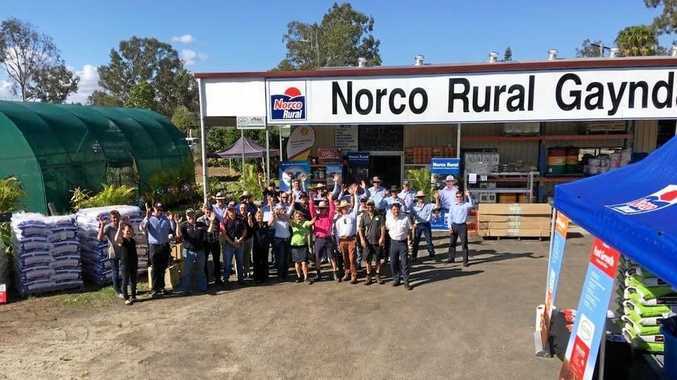 "We need to tell people if they are planning a long trip, you need to stop. You don't get a second chance. "If you fall asleep and move onto the incorrect side of the road and collide with something big like a truck, you're in serious trouble." 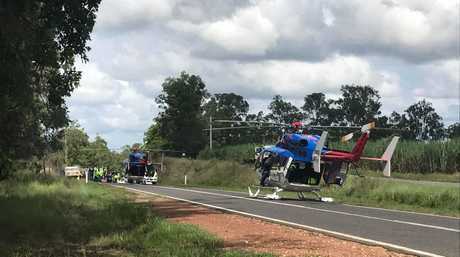 Two RACQ LifeFlight Rescue helicopters were called to the scene of the accident. 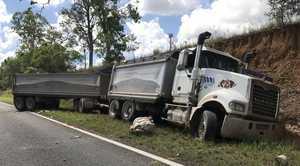 EARLIER: Emergency crews are at the scene of a serious crash on Maryborough Biggenden Rd involving a truck and car. Five people are being assessed at the scene. 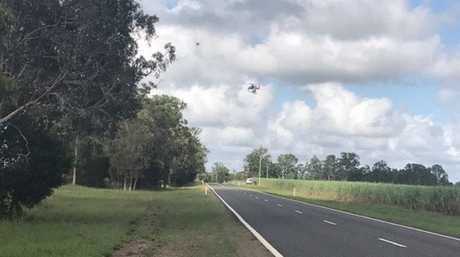 A Queensland Ambulance Service spokeswoman said a 17-year-old teenager had a serious head injury. t injury and is in a stable condition. A man, also believed to be in his 60s is in a stable condition with a serious leg injury. One of the other patients involved in the crash had minor injuries and a man in his 20s was uninjured. A section of the road had been cleared to make way for the arrival of two helicopters. Three people will be taken to hospital. The crash happened just before 8am. premium_icon Why was this idiot driving?